Usually, I would tell you that Valentine’s Day is not my thing. We really don’t do much to celebrate the holiday (we’ll actually be traveling this year, so a glass of wine in the Delta lounge may be about it), but for some reason I’m very excited about it this year! I also actually really enjoyed doing holiday gift guides this year so that inspired me to put together a couple of them for Valentine’s Day, as well. 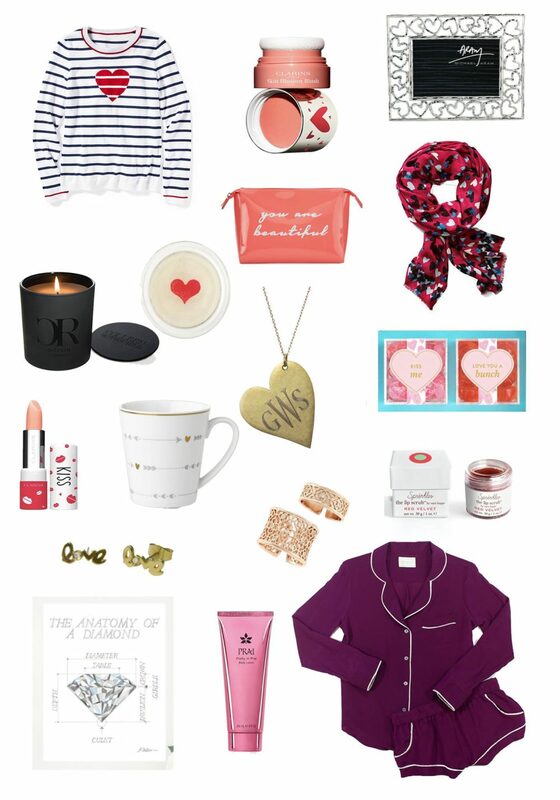 Today we’re talking gifts for her and I’ve rounded up some of my favorite Valentine’s Day gift ideas for your sisters, moms, girlfriends, co-workers, or whoever you’re celebrating with! GoldenThread Jewelry has some of the greatest “love” and heart themed pieces. You may have seen me wear my antique heart necklace last fall (see the post here), and I still wear it quite often. It has my boys’ initials on each side and it’s a piece I really treasure. Use the code ILOVEYOU right now for 30% off site wide, including these super cute “love” earrings! While it’s not practical to buy diamonds for all the ladies in your life, it is quite doable to pick up a few diamond prints for the bling-loving girl. There are also really cute pillows with different diamond cuts on them that are a great gift idea. I’m even into dressing up for the holiday this year (stay tuned for my outfit idea guide later this week) and this preppy and cute stripes & heart sweater is going to be perfect with jeans or even a navy pencil skirt if you’re dressing it up for work. Love these adorable pjs! So many great gift ideas! Love all of these gift ideas! Especially those cute pajamas! Can’t believe it’s only 2 weeks away already! This is a great roundup! I love that pj set! Those pj’s are so cute! I love that little PJ set! It would be the perfect V-Day gift! I love the PJ’s and the gold heart necklace! Perfect Valentine’s gift for anyone! Adore the necklace. Love the cuff bracelet too.